Polymorphonuclear neutrophils (PMN) are crucial in the innate host defense by their ability to rapidly accumulate in inflamed tissues and clear a site of infection from microbial pathogens by their potent effector mechanisms. The triggering receptor expressed on myeloid cells (TREM)-1 is a recently described activating receptor on PMN with an important role in inflammation. However, the effects of TREM-1 stimulation on a cellular level remain to be further defined. To characterize TREM-1-mediated activation of human PMN, we evaluated the effect of receptor ligation on PMN effector functions. Activation via TREM-1 induces immediate degranulation of neutrophilic granules resulting in the release of IL-8, respiratory burst, and phagocytosis. TREM-1 ligation synergizes with the activation by the Toll-like receptors (TLR) ligands LPS, Pam3Cys, and R-848. In contrast, no synergy between TREM-1- and TLR-mediated stimulation was observed concerning PMN survival, whereas TLR-mediated stimuli protect PMN from apoptosis, concurrent TREM-1 activation neutralizes these anti-apoptotic effects. These results give a new perspective for the regulation of neutrophil inflammatory responses emphasizing the importance of TREM-1 in innate immunity. Polymorphonuclear neutrophils (PMN)4 are the most abundant leukocytes in human peripheral blood and have crucial functions as the first line of defense against microbial pathogens. They contribute to the early innate immune response by rapidly migrating into inflamed tissues, where they use potent effector mechanisms like phagocytosis, production of reactive oxygen species, and the release of inflammatory mediators and antimicrobial substances (1, 2, 3, 4). In inflammation, neutrophil activation occurs i.e., in the presence of IL-8, IFN-γ, and heat shock proteins (3, 5, 6), or is initiated upon recognition of Ab or complement opsonized particles (4). In addition, PMN directly recognize microbial products via pathogen recognition receptors or Toll-like receptors (TLR) (7, 8, 9, 10). Under inflammatory conditions and also in homeostasis, it is critical that the activation and survival of neutrophils is tightly regulated, since the release of cytotoxic substances by PMN can easily cause collateral damage of adjacent healthy tissue (11, 12). Apoptosis is an important mechanism of safely eliminating PMN during the resolution of inflammation. In parallel with the activation of PMN effector functions, many inflammatory mediators also regulate cell survival by altering apoptosis (13). Cytokines like GM-CSF, as well as bacterial products like LPS, delay apoptosis (10, 14) while other factors may promote programmed cell death of PMN, i.e., TNF-α or CD137 (15, 16). Recently, the triggering receptor expressed on myeloid cells (TREM)-1 was described as a novel activating receptor on PMN and monocytes (17). TREM-1 is a 30-kDa Ig super family member, and expression is up-regulated by lipoteichoic acid (LTA) or LPS. In synergy with LPS, TREM-1 ligation has been shown to stimulate the release of IL-8 and myeloperoxidase (MPO) from PMN. In monocytes, this synergistic effect of TREM-1 and LPS has been demonstrated for a variety of inflammatory mediators like MCP-1, MIP-1α, and IL-8, as well as TNF-α and GM-CSF (17, 18). Although the natural ligands for TREM-1 remain to be identified, the importance of TREM-1 in acute inflammatory responses has been demonstrated in mouse models for septic shock where competition of TREM-1 by a recombinant soluble TREM-1 fusion protein saved mice from lethal LPS challenge or bacterial sepsis (19). In the present study, we investigated the activation and survival of PMN using a TREM-1-specific agonistic mAb. We describe that ligation of TREM-1 induces rapid degranulation of neutrophilic granules and beyond this, respiratory burst as well as phagocytosis, the major effector functions for clearance of pathogens. The activation of effector functions occurs synergistically with various TLR ligands. In contrast, TREM-1 accelerates apoptosis in the TLR-stimulated PMN population. Thus, we describe a new regulatory role for TREM-1-mediated signals in the resolution of acute inflammations and the control of PMN activity. mAbs against TREM-1 (clone 21C7 and 9E2.1E7) and F(ab′)2 fragments of 9E2.1E7 were kindly provided by A. Bouchon (Bayer, Leverkusen, Germany). A control mouse IgG1 was purchased from Sigma-Aldrich (Taufkirchen, Germany) or a monoclonal MHC class I-specific mouse IgG1 (clone PA2.6) from S. Stevanovic (Institute for Cell Biology, Department of Immunology, University of Tübingen) was used (20). All mAbs were endotoxin-free (<0.1 endotoxin U/μg protein) determined by a Limulus amebocyte lysate assay (QCL-1000; BioWhittaker, Verviers, Belgium). LPS from Salmonella typhimurium was from Sigma-Aldrich, palmitoyl-3-Cys-Ser-(Lys)4 (Pam3Cys) from EMC Microcollections (Tübingen, Germany), poly(I:C) from WAK Chemie Medical (Dessau, Germany), and R-848 from InvivoGen (San Diego, CA). Polymyxin B was purchased from Sigma-Aldrich, IFN-γ was from BD PharMingen (San Diego, CA), and GM-CSF from Immunex (Seattle, WA). The following mAbs were used for analysis by FACS: FITC-labeled mAbs against CD66b (Coulter Immunotech, Hamburg, Germany), R-PE-labeled mAbs against CD11b, and respective isotype controls (all purchased from BD PharMingen). Polyclonal rabbit Abs against TLR2 and TLR4 were from Santa Cruz Biotechnologies (Santa Cruz, CA). PMN were separated from heparinized blood of healthy volunteer donors by dextran sedimentation using Polymorphprep (Nycomed, Oslo, Norway) as described previously (6). Residual RBC were removed by a hypotonic lysis step (150 mM ammonium chloride, 1 mM potassium bicarbonate, and 0.1 mM ethylene diamine tetra acetate (all from Sigma-Aldrich) in water, pH 7.3, for 5 min). Purity of cell preparation was assessed by FACS with CD66b as a marker for PMN. In general, 95–98% of cells were CD66b-positive PMN. To study TREM-1-mediated activation, 96-well plates (Costar, Cambridge, MA) were coated with the respective mAbs (10 μg/ml for 3 h at 37°C) and washed twice with PBS. Then purified PMN (2 × 106/ml in RPMI 1640 with 10% (v/v) FBS; PAN Biotech, Aidenbach, Germany) and additional stimuli as indicated were added. Cells were cultured at 37°C with 7.5% CO2 in air. PMN (2 × 105) were incubated with the indicated mAbs in PBS with 1% (w/v) BSA and 0.05% sodium azide (Sigma-Aldrich; FACS buffer) on ice, then washed twice with FACS buffer and resuspended in FACS buffer. All analyses were performed using FACSCalibur (BD Biosciences, Heidelberg, Germany) and CellQuest (BD Biosciences) software. For analysis by ELISA, supernatants were derived from stimulation with purified PMNs after 6 h and frozen at −20°C until required. Supernatants were analyzed by ELISA for IL-8 (OptEIA; BD PharMingen) or lactoferrin (OXISResearch, Portland, OR) according to the manufacturer’s instructions. The presence of hydrogen peroxide was detected by oxidation of dichlorfluorescein diacetate (DCFH-DA; Sigma-Aldrich) into green fluorescent dichlorfluorescein (21). The phagocytic activity was evaluated by ingestion of PE-labeled polystyrene micro spheres (1 μm diameter, Fluoresbrite Plain Microspheres PCRed; Polysciences, Warrington, PA) as described previously (6). Briefly, PMN (2 × 105) were stimulated as indicated in the presence of 25 μM DCFH-DA and 5 × 106 microbeads (E:T ratio 1:25) for 15–90 min at 37°C, then kept on ice, washed twice in FACS buffer, and fixed in 1% paraformaldehyde in PBS. Analysis was performed by FACS. The amount of phagocytosis was quantified as percentage PE-positive events in the indicated region (see Fig. 3⇓). The respiratory burst activity was quantified as mean fluorescence intensity (MFI) in this assay. For validation, the respiratory burst and phagocytosis assays were also performed separately in parallel with identical results. In addition, phagocytic activity was assessed by evaluating the percentage of phagocytosis by fluorescence microscopy (Axioplan; Zeiss, Jena, Germany) counting the number of red fluorescent cells in three high power fields. The results obtained by microscopical analysis were equivalent to analysis by FACS (data not shown). For the analysis of respiratory burst kinetics, cells were labeled with DCFH-DA as described above, stimuli were added as indicated and kept at 37°C in a fluorescence reader (SPECTRAFluor 4; Tecan, Crailsheim, Germany). Relative fluorescence units were measured at excitation wavelength 485 nm and emission wavelength 520 nm for 3 h in 5-min intervals. Specific fluorescence index of stimulated cells was obtained by subtraction of background fluorescence of labeled cells incubated in medium alone at the corresponding time points. The amount of apoptotic cells was evaluated by detection of DNA fragmentation quantifying hypodiploid nuclei according to a modified protocol described by Nicoletti et al. (22). Briefly, PMN (2 × 105) were resuspended in staining buffer (50 μg/ml propidium iodide (PI) in 0.1% sodium citrate plus 0.1% Triton X-100; Sigma-Aldrich), incubated at 4°C for 2 h, and analyzed by FACS. Alternatively, the amount of apoptotic PMN was analyzed by labeling with annexin-V-FITC (BD PharMingen) detecting externalized phosphatidyl-serin on the cell surface and concurrently cell membrane integrity by PI (5 μg/ml) as described elsewhere (23). Analysis was performed by FACS. Usually, PMN recovery from cell culture wells after 24 h was comparable among differently stimulated cells and ranged from 80 to 90%. The statistical significance of the data was analyzed using a paired two-tailed Student’s t test for comparison between two groups. For multivariate analyses, the data was analyzed by two way ANOVA. For all analyses, p < 0.05 was considered statistically significant. TREM-1 has been shown to induce the release of MPO and IL-8 (17). To further characterize TREM-1-mediated activation of PMN, we investigated the kinetics of degranulation by monitoring surface up-regulation of CD66b and CD11b as surrogate markers for the release of specific and gelatinase granules, respectively (24, 25). Titration experiments of TREM-1-specific mAbs revealed a concentration of 10 μg/ml coated on plastic as the optimal dose for inducing degranulation (data not shown). Therefore, this concentration was used for all following experiments. We found that cross-linking of TREM-1 using an immobilized agonistic mAb resulted in a strong surface increase of CD66b (2.6-fold; Fig. 1⇓A) and CD11b (1.8-fold; Fig. 1⇓B) already after 1 h of stimulation. Similar results were obtained when F(ab′)2 fragments of the TREM-1-specific mAb were used, whereas control F(ab′)2 fragments did not induce activation (data not shown). Corresponding to the surface up-regulation of CD66b and CD11b, the release of IL-8 and lactoferrin was detected in the culture supernatant after stimulation with anti-TREM-1, but not after stimulation with an isyotype-matched mAb against an irrelevant Ag (Fig. 2⇓, C and D). TREM-1 mediates immediate degranulation. PMN were cultured on anti-TREM-1 (filled histograms) or control mouse IgG1 (open histograms)-coated 96-well plates and labeled with anti-CD66b (A) and anti-CD11b (B) as described in Materials and Methods. The broken histograms correspond to the respective isotype controls. The results shown are representative of eight independent experiments. Surface expression of CD66b (C) and CD11b (D) after 15- to 90-min incubation with anti-TREM-1 (•) or control mouse IgG1 (○) are presented as mean ± SE performed in duplicate. One representative of three independent experiments is shown. TREM-1 is synergistic with TLR2, TLR4, and TLR7/8 ligands for degranulation, but not for phagocytosis. A and B, PMN were cultured for 1 h on anti-TREM-1 or a control mouse IgG1-coated 96-well plates in the presence of medium alone or TLR ligands as indicated. Cells were harvested and assayed for degranulation or phagocytosis as described in Materials and Methods. 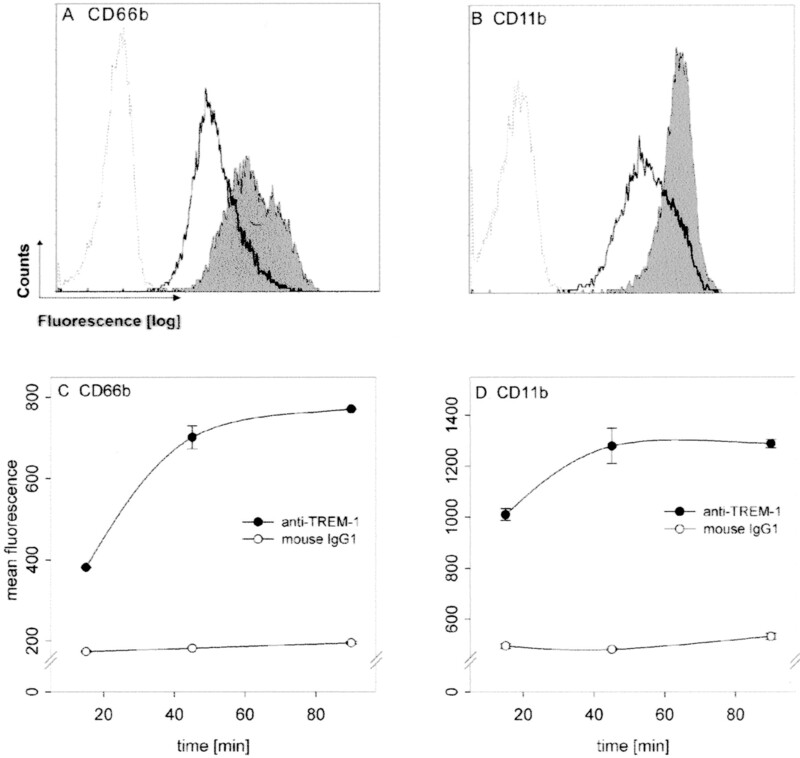 The summarized data from four to eight independent experiments are shown (mean ± SE) for degranulation by up-regulation of CD66b (A) or phagocytosis (B). C and D, PMN were incubated with 100 μg/ml mouse IgG1 for 30 min before the cells and the respective stimuli were added to anti-TREM-1- or anti-HLA-ABC-coated 96-well plates. Supernatants derived from stimulated PMN were collected after 6 h and analyzed for IL-8 (C) by ELISA. The summarized results from four independent experiments assayed in triplicate wells are shown (mean + SE). D, Supernatants derived from PMN stimulated as before were analyzed for the release of lactoferrin by ELISA. Statistical analyses for all data shown by two-way ANOVA indicate that the differences among the groups are significant (p < 0.05). As shown in Fig. 1⇑, C and D, TREM-1-stimulated PMN up-regulate CD66b and CD11b on the cell surface as early as 15 min following stimulation, demonstrating that TREM-1 triggers instant degranulation upon receptor ligation. In addition to the release of hydrolytic enzymes and cytotoxic substances from granules, the activation of PMN effector functions is characterized by enhanced phagocytosis and the production of reactive oxygen species (4). 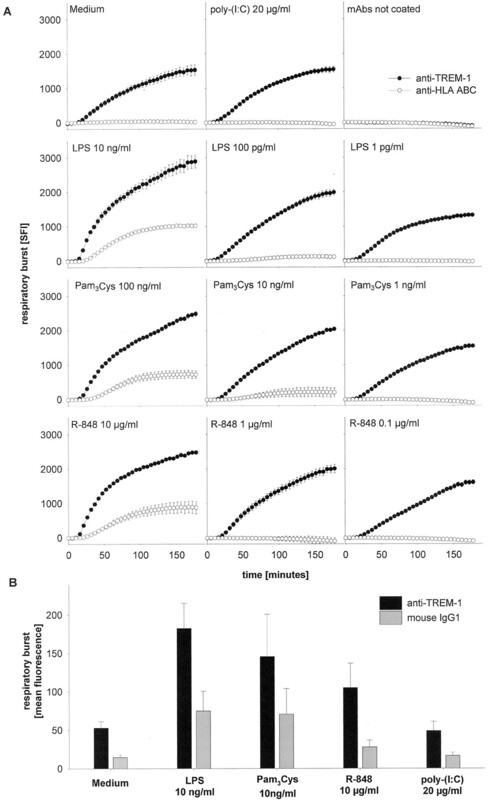 Since TREM-1 ligation results in rapid degranulation, we investigated whether other PMN effector functions are also involved in TREM-1-mediated activation. We determined the effect of TREM-1 stimulation on respiratory burst and phagocytosis by analysis of hydrogen peroxide production and phagocytosis of unopsonized polystyrene beads, as described previously (6, 21). As shown in Fig. 3⇓A, TREM-1 stimulation enhances both phagocytosis and respiratory burst in PMN independently of each other. 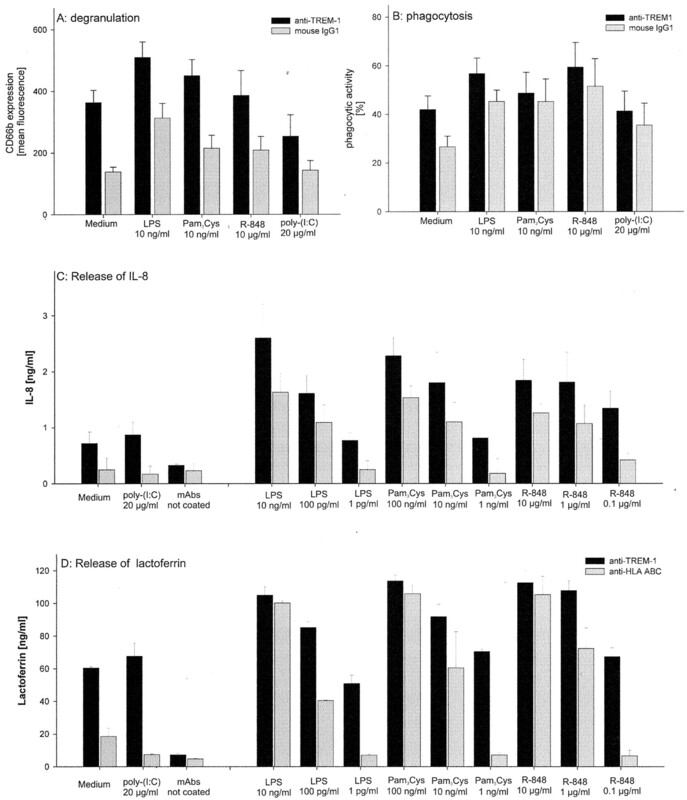 Although there was only a moderate increase in phagocytic activity (Fig. 3⇓C) of ∼20 ± 2.4% (mean ± SEM) with the control mAb up to 37 ± 6.6% with TREM-1 stimulation (p < 0.05 by paired t test), we observed an almost 4-fold induction of respiratory burst in the presence of anti-TREM-1 (51 ± 9.4 MFI) compared with the control (13 ± 4.4 MFI) (p < 0.05 by paired t test), depicted in Fig. 3⇓D. 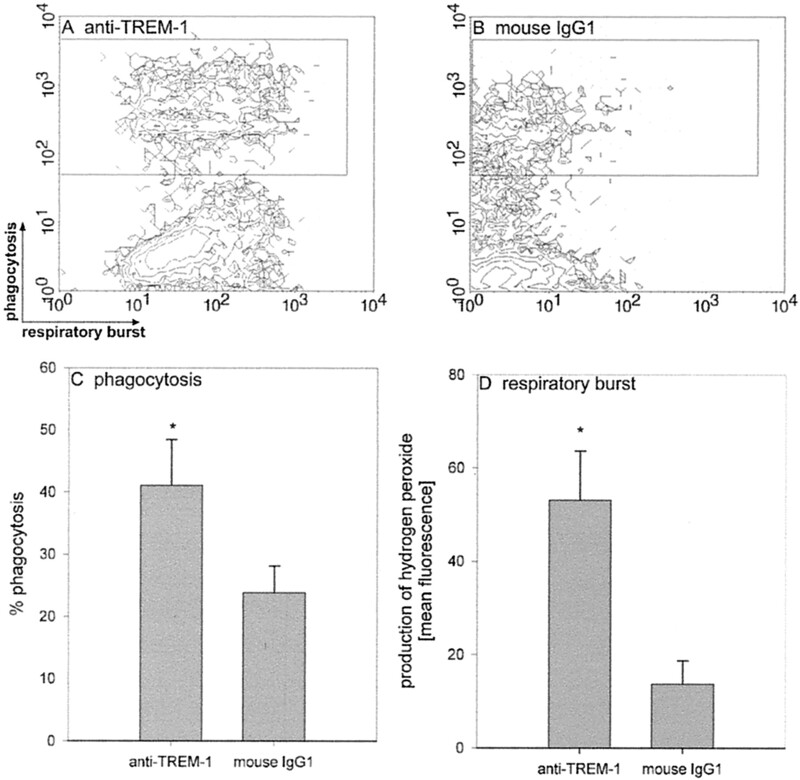 TREM-1 activates respiratory burst and phagocytosis. PMN were cultured on anti-TREM-1 (A) or control mouse IgG1-coated (B) 96-well plates in the presence of DCFH-DA and PE-labeled microspheres for 90 min as described in Materials and Methods. One representative of seven independent experiments is shown. The summarized data from seven experiments are shown as percent phagocytosis (C) or respiratory burst (D). All data are indicated as mean ± SE. ∗, A statistically significant difference compared with the control (p < 0.05 by paired Student’s t test). The kinetics of the TREM-1-mediated respiratory burst induction indicated a strong and persistent increase in hydrogen peroxide production in anti-TREM-1 stimulated cells, but not in cells incubated with control mAb against an irrelevant Ag (Fig. 4⇓A). The respiratory burst mediated by TREM-1 is synergistic with TLR2, TLR4, and TLR7/8 ligands. A, PMN were preincubated with 100 μg/ml mouse IgG1 to block potential unspecific interactions with coated mAbs and labeled with DCFH-DA. Then the cells were added (2 × 105 per well) to anti-TREM-1 or anti-HLA-ABC (control)-coated 96-well plates in the presence of medium alone or TLR ligands as indicated and incubated in a fluorescence reading device as described in Materials and Methods. As additional control, the mAbs were added in solution to demonstrate that only the immobilized anti-TREM-1 mediates activation. The results from one representative of three independent experiments are depicted as the mean ± SE from triplicate wells. B, PMN were concurrently stimulated with the indicated TLR ligands and anti-TREM-1 or mouse IgG1 and incubated at 37°C for 1 h. Subsequently, the cells were harvested, fixed with 1% paraformaldehyde, and analyzed by FACS. The summarized results from six independent experiments are shown (mean ± SE). Statistical analysis of the summarized results by two-way ANOVA indicates a significant difference (p < 0.05). This indicates that TREM-1 differentially affects effector functions in PMN and demonstrates that in addition to degranulation, TREM-1 is also able to induce the neutrophil respiratory burst as well as phagocytosis in PMN, and thus activate the full armament of effector mechanisms. TREM-1 ligation has been shown to act synergistically with LPS on PMN activation indicating that there is a link between TREM-1- and TLR-mediated cell activation (17, 19). Bouchon et al. (17) demonstrated that LPS, as well as LTA stimulation of PMN, results in an increased TREM-1 expression and that LPS augments TREM-1-mediated release of MPO and IL-8. We investigated whether stimuli other than LPS act synergistically with TREM-1 and used Pam3Cys, a known TLR2 ligand (9, 25), the TLR3 ligand poly(I:C) (27), or the TLR7/8 ligand R-848 (28) as additional stimuli to study effector functions of TREM-1-activated PMN. In the presence of the control mAb, LPS, Pam3Cys, and also R-848, mediated activation of PMN by enhanced hydrogen peroxide production in a concentration dependent manner (Fig. 4⇑A), degranulation analyzed by surface up-regulation of CD66b, and the release of IL-8 or lactoferrin as well as phagocytosis (Fig. 2⇑). However, parallel stimulation with anti-TREM-1 potentiated only the respiratory burst (Fig. 4⇑) and degranulation (Fig. 2⇑, A, C, and D). Analysis of the respiratory burst kinetics mediated by concurrent TLR ligand and anti-TREM-1 stimulation demonstrated that TREM-1 enhanced the TLR ligand-mediated burst both in time and magnitude compared with cells stimulated with TLR ligands and the control mAb (Fig. 4⇑). As opposed to this, we were not able to detect this effect for the phagocytosis (Fig. 2⇑B). As already reported in Fig. 3⇑, the phagocytic activity was moderately enhanced by TREM-1 alone, but concurrent stimulation with Pam3Cys, LPS, or R-848 only provided little additional stimulation of this effector function. Notably, when PMN were stimulated with poly(I:C), we were not able to detect any activation of PMN effector functions beyond the effects already mediated by TREM-1 alone (Figs. 2⇑ and 4⇑). This indicates that PMN are not responsive to this TLR3-mediated stimulus and also suggests that the activation detected by the other stimuli is not due to residual monocytes potentially present after the PMN purification procedure as these cells are sensitive to poly(I:C)-mediated stimulation (18). These results clearly show that the synergistic activation mechanisms of TREM-1 are not restricted to LPS, but also true for the TLR2 ligand Pam3Cys, and also for the TLR7/8 ligand, R-848. The duration of the neutrophil inflammatory response is regulated by the modulation of apoptosis (13). We analyzed the effect of TREM-1 ligation on PMN survival by analyzing DNA fragmentation or labeling with annexin V. As shown in Fig. 5⇓, stimulation of PMN for 24 h with anti-TREM-1 resulted in a transient and minor reduction of the percentage of apoptotic cells (Fig. 5⇓A, upper panel) compared with cells incubated with the control mAb (Fig. 5⇓A, lower panel) which was not statistically significant. At later times we did not observe a TREM-1-mediated protection from apoptosis at all (Fig. 5⇓A, right panel). However, the TLR ligands, LPS or R-848, rescued the majority of PMN from constitutive apoptosis when incubated alone (not shown) or in the presence of the control mAb (Fig. 5⇓B, lower panel). In agreement with previous results by Sabroe and coworkers (9), the anti-apoptotic effect of the TLR2 ligand Pam3Cys was considerably weaker. However, concurrent PMN stimulation via TREM-1 abrogated these anti-apoptotic effects (Fig. 5⇓B, upper panel). 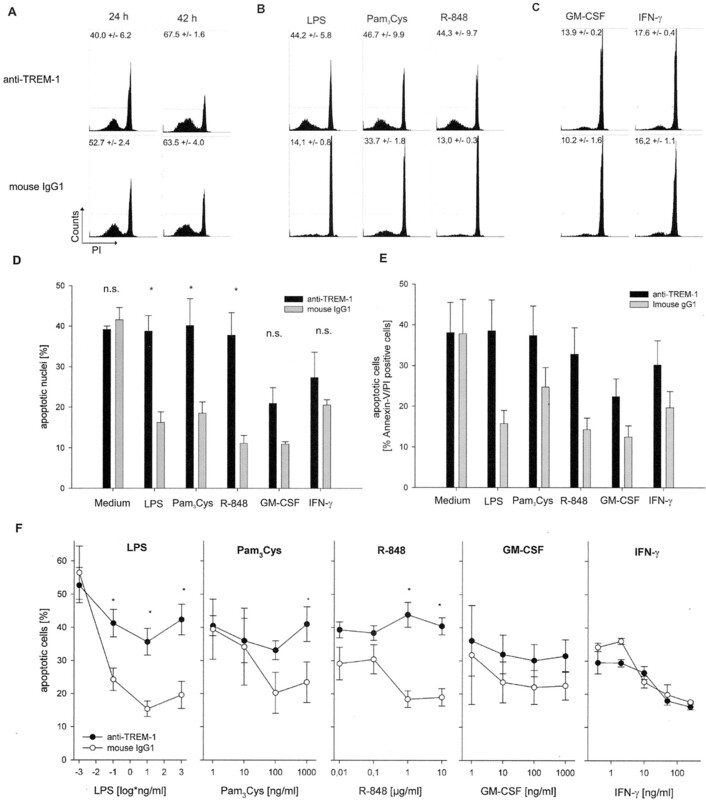 In contrast, the prolonged survival of PMN mediated by the TLR-independent stimuli IFN-γ or GM-CSF was not affected by TREM-1 indicating that the effect of TREM-1 stimulation on apoptosis is restricted to the TLR pathway (Fig. 5⇓C). The data obtained by analysis of DNA fragmentation (Fig. 5⇓D) were analogous to the stainings with annexin-V/PI (Fig. 5⇓E) further supporting these results. As depicted in Fig. 5⇓F, the observed effects apply over the full dose range of LPS and R-848, whereas the effects for Pam3Cys were again weaker. 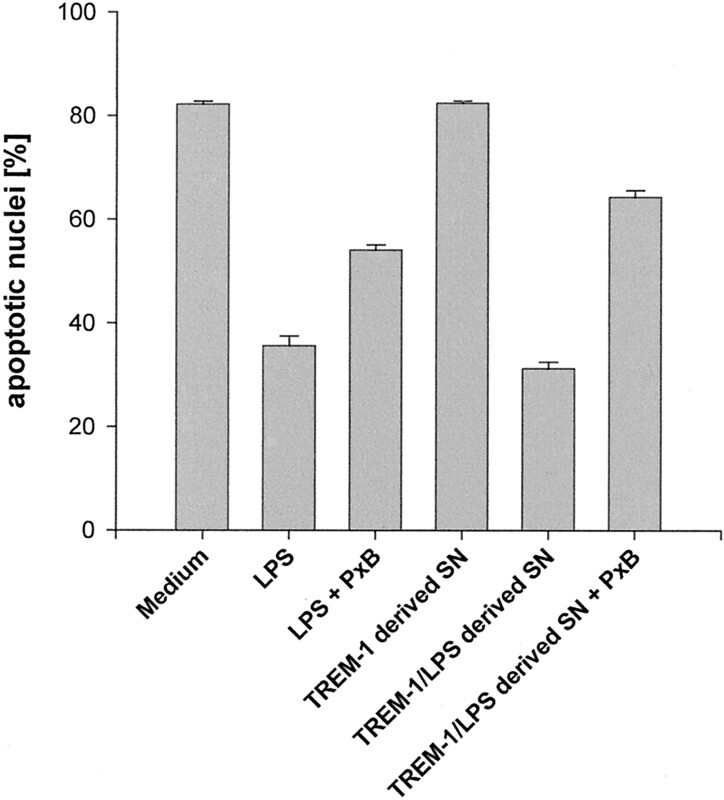 TREM-1 induces accelerated apoptosis in TLR ligand-activated PMN. A–C, PMN were cultured for 24 or 42 h (B and C) on anti-TREM-1- or control mouse IgG1-coated 96-well plates in the presence of the indicated stimuli (1 μg/ml LPS, 1μg/ml Pam3Cys, 5 μg/ml R-848, 1 μg/ml GM-CSF, or 250 ng/ml IFN-γ) and assayed for apoptosis by analyzing DNA fragmentation. The depicted numbers are the percentage of events in the indicated gate (mean ± SE) assayed in duplicates from one representative experiment. D, The summarized results of analysis of DNA fragmentation after 42 h from four independent experiments each performed in duplicates are depicted (mean ± SE). E, The summarized results of analysis of annexin V/PI double stainings after 42 h from two independent experiments each performed in duplicates are depicted as mean ± SE. F, The pecentage of annexin V/PI-positive PMN after 42 h on anti-TREM-1- or control mouse IgG1-coated plates titrating the indicated stimuli is shown (mean ± SE) from two independent experiments each in duplicate. ∗, A statistically significant difference (p < 0.05) between TREM-1-stimulated cells vs the respective control mouse IgG1 (by paired Student’s t test). As to be expected, supernatants derived from anti-TREM-1-stimulated PMN did not protect the cells from apoptosis, but supernatants derived from anti-TREM-1- and LPS-stimulated cells did (Fig. 6⇓). The prolonged survival was neutralized in part by adding the LPS inhibitor, polymyxin B, indicating that this effect is due to the remaining LPS in the supernatant. The abrogative effects of TREM-1/LPS on PMN survival are not mediated by soluble factors. PMN were incubated for 42 h with supernatants-derived TREM-1/LPS-stimulated PMN (after 24 h stimulation) or LPS (1 μg/ml) in the presence or absence of the LPS inhibitor, polymyxin B (50 μg/ml), and cell survival was analyzed by DNA fragmentation. The results from one of three independent experiments performed in duplicates are shown (mean ± SE). These results demonstrate that TREM-1 plays a regulatory role not only in activating effector functions, but also in limiting PMN survival and, along with this, an ongoing inflammatory response by the induction of apoptosis. In the innate immune response, PMN have a crucial role in the recognition and clearance of microbial pathogens (1, 2, 3, 4). The rapid employment of their potent effector functions arms PMN to be highly effective in the clearance of bacteria or fungi. However, it is equally important to tightly control these PMN functions, since inadequate neutrophil activation might cause severe collateral damage of the adjacent tissue (13). Bouchon et al. (17, 19) reported earlier that ligation of TREM-1 on LPS-stimulated cells results in the enhanced activation of PMN. In our experiments, we first focused on the kinetics of TREM-1-mediated PMN activation and demonstrate that receptor ligation results in the immediate activation of neutrophil effector functions. Beyond the already described degranulation of neutrophilic granules, TREM-1 mediates an instant degranulation as soon as 15 min after receptor ligation. These observations in PMN fit well with the signaling events already described in monocytes (17), demonstrating that TREM-1 ligation causes immediate intracellular calcium mobilization and tyrosine phosphorylation of ERK and PLC-γ, important prerequisites for the activation of neutrophil effector functions like degranulation (25) and the initiation of respiratory burst and phagocytosis in PMN (4, 29). Therefore, our results extend the knowledge of TREM-1-mediated neutrophil activation by two other important effector functions and further underline the important role of TREM-1 in microbial infection (17, 18, 19). However, considering the strong effects of TREM-1 on degranulation and respiratory burst, it is an interesting observation that TREM-1 only mediates a moderate increase in phagocytosis of ∼17% (Fig. 2⇑). This is in agreement with the recent observations of Bleharski et al. (18) in monocytes who reported an increase of ∼15% in the uptake of FITC-labeled dextran following TREM-1 stimulation. This indicates that TREM-1-mediated neutrophil activation is apparently focused on degranulation and respiratory burst rather than phagocytosis. In agreement with previous data, we found that concurrent stimulation with TREM-1 and LPS mediates a synergistic effect on PMN activation (17, 19). Beyond this, we also demonstrate in this study that Pam3Cys and R-848 activate PMN in a very similar fashion (Figs. 3⇑ and 4⇑), while we do not observe stimulatory effects of poly(I:C). This indicates that PMN are equipped with a different set of TLRs than monocytes since Bleharski et al. (18) were able to detect monocyte activation by poly(I:C) in their studies. In contrast, our results are in agreement with other previous reports limiting TLR3 expression to dendritic cells (30, 31). So far, the antiviral compound, R-848, has been shown to stimulate only dendritic cells and macrophages (28). On PMN, the expression of TLR7/8 has only been studied on the mRNA level showing that only TLR7-, but not TLR8-specific mRNA is up-regulated in PMN upon activation with bacteria (32). Our results that R-848 mediates PMN activation indicate that TLR7/8 is also functionally active and contributes to PMN-mediated inflammatory responses. Further studies with regard to the mechanisms of R-848-mediated activation of PMN are currently being conducted. To prevent self-damage the regulation of neutrophil survival is a crucial event during the resolution of inflammation following the clearance of the respective pathogen (13). In PMN, a major mechanism for this is the regulation of apoptosis (12). Although inflammatory mediators like GM-CSF, IFN-γ, or LPS are known to delay apoptosis in PMN (9, 13, 14), others like TNF-α or CD137 may promote apoptosis in these cells (15, 16). We demonstrate that in addition to LPS, the TLR7/8 ligand, R-848, is also a strong stimulus to save PMN from apoptosis. Surprisingly, despite the strong activation of effector mechanisms, TREM-1 alone induces only minor changes of PMN survival, and this despite the release of IL-8 that is reported to promote PMN survival (33). However, the ability of TREM-1 to abrogate the potent anti-apoptotic effects of TLR-dependent survival signals suggests a new role for TREM-1 in counter-regulating inflammatory responses by promoting neutrophil apoptosis in the presence of TLR-mediated activation. Even more interestingly, the delay of apoptosis mediated by the inflammatory mediators, GM-CSF or IFN-γ, is not affected by TREM-1. The underlying mechanism for this is presently not clear, but this effect is obviously not dependent on soluble factors as the proapoptotic effects of anti-TREM-1/LPS stimulation cannot be transferred by supernatants (Fig. 6⇑). As described previously (9, 10), we observe an up-regulation of TLR2 and down-regulation of TLR4 surface expression on PMN after stimulation with TLR ligands or GM-CSF (data not shown), thus not providing a likely explanation for the observed effects on survival. Our results indicate that TREM-1 specifically interferes with survival signals mediated by the TLR pathway and suggest that this effect is regulated within the cell by intercrossing signaling pathways. Recently, Choi and coworkers (33) reported that LPS-mediated PMN survival is dependent on NF-κB activation, whereas GM-CSF-mediated survival is not. This might indicate that TREM-1 signaling interferes with LPS-mediated activation of NF-κB and thus provides a possible explanation for our observations. Taken together, our results demonstrate that activation via TREM-1 is a strong and immediate stimulus not only of neutrophil degranulation, but of the full armament of effector mechanisms, including the respiratory burst and, to a lesser extent, phagocytosis. TREM-1 activation of PMN acts synergistically with TLR2, TLR4, and TLR7/8 ligand-mediated activation with regard to effector mechanisms, but antagonistically for survival. These results shed new light on the function of TREM-1 as a regulator of inflammatory responses. We thank Nicole Arnold for excellent technical assistance, and Dr. A. Bouchon for generously providing the TREM-1-specific mAbs. 1 This work was supported by grants from the Deutsche Forschungsgemeinschaft (Sonderforschungsbereich 510, C1 to H.S. ), the European Union (European Community Project QLK3-CT-1999-00064), by a grant from the Federal Ministry of Education and Research (Fö. 01KS9602), the Interdisciplinary Center of Clinical Research Tübingen and the University of Tübingen (Fortüne-Programm Project No. 1088-0-0). ↵3 Present address: Institute of Immunology, University of Mainz, Obere Zahlbacher Strasse 67, D-55131 Mainz, Germany. ↵4 Abbreviations used in this paper: PMN, polymorphonuclear neutrophil; TLR, Toll-like receptor; TREM-1, triggering receptor expressed on myeloid cells; Pam3Cys, palmitoyl-3-Cys-Ser-(Lys)4; LTA, lipoteichoic acid; MPO, myeloperoxidase; DCFH-DA, dichlorfluorescein diacetate; MFI, mean fluorescence intensity. Lloyd, A. R., J. J. Oppenheim. 1992. Poly’s lament: the neglected role of the polymorphonuclear neutrophil in the afferent limb of the immune response. Immunol. Today 13:169. Ben-Baruch, A., D. F. Michiel, J. J. Oppenheim. 1995. Signals and receptors involved in recruitment of inflammatory cells. J. Biol. Chem. 270:11703. Livingston, D. H., S. H. Appel, G. Sonnenfeld, M. A. Malangoni. 1989. The effect of tumor necrosis factor-α and interferon-γ on neutrophil function. J. Surg. Res. 46:322. Radsak, M. P., N. Hilf, H. Singh-Jasuja, S. Braedel, P. Brossart, H. G. Rammensee, H. Schild. 2003. The heat shock protein Gp96 binds to human neutrophils and monocytes and stimulates effector functions. Blood 101:2810. Downey, G. P., T. Fukushima, L. Fialkow, T. K. Waddell. 1995. Intracellular signaling in neutrophil priming and activation. Semin. Cell. Biol. 6:345. Neufert, C., R. K. Pai, E. H. Noss, M. Berger, W. H. Boom, C. V. Harding. 2001. Mycobacterium tuberculosis 19-kDa lipoprotein promotes neutrophil activation. J. Immunol. 167:1542. Sabroe, I., L. R. Prince, E. C. Jones, M. J. Horsburgh, S. J. Foster, S. N. Vogel, S. K. Dower, M. K. Whyte. 2003. Selective roles for Toll-like receptor (TLR)2 and TLR4 in the regulation of neutrophil activation and life span. J. Immunol. 170:5268. Kurt-Jones, E. A., L. Mandell, C. Whitney, A. Padgett, K. Gosselin, P. E. Newburger, R. W. Finberg. 2002. Role of Toll-like receptor 2 (TLR2) in neutrophil activation: GM-CSF enhances TLR2 expression and TLR2-mediated interleukin 8 responses in neutrophils. Blood 100:1860. Dancey, J. T., K. A. Deubelbeiss, L. A. Harker, C. A. Finch. 1976. Neutrophil kinetics in man. J. Clin. Invest. 58:705. Savill, J., I. Dransfield, C. Gregory, C. Haslett. 2002. A blast from the past: clearance of apoptotic cells regulates immune responses. Nat. Rev. Immunol. 2:965. Simon, H. U.. 2003. Neutrophil apoptosis pathways and their modifications in inflammation. Immunol. Rev. 193:101. Dibbert, B., M. Weber, W. H. Nikolaizik, P. Vogt, M. H. Schoni, K. Blaser, H. U. Simon. 1999. Cytokine-mediated Bax deficiency and consequent delayed neutrophil apoptosis: a general mechanism to accumulate effector cells in inflammation. Proc. Natl. Acad. Sci. USA 96:13330. Murray, J., J. A. Barbara, S. A. Dunkley, A. F. Lopez, X. Van Ostade, A. M. Condliffe, I. Dransfield, C. Haslett, E. R. Chilvers. 1997. Regulation of neutrophil apoptosis by tumor necrosis factor-α: requirement for TNFR55 and TNFR75 for induction of apoptosis in vitro. Blood 90:2772. Parham, P., W. F. Bodmer. 1978. Monoclonal antibody to a human histocompatibility alloantigen, HLA-A2. Nature 276:397. Lehmann, A. K., S. Sornes, A. Halstensen. 2000. Phagocytosis: measurement by flow cytometry. J. Immunol. Methods 243:229. Nicoletti, I., G. Migliorati, M. C. Pagliacci, F. Grignani, C. Riccardi. 1991. A rapid and simple method for measuring thymocyte apoptosis by propidium iodide staining and flow cytometry. J. Immunol. Methods 139:271. Vermes, L., C. Haanen, H. Steffens-Nakkin, C. Reutlingsberger. 1995. A novel assay for apoptosis: flow cytometric detection of phosphatidylserine expression on early apoptotic cells using fluorescein labelled annexin V. J. Immunol. Methods 184:39. Rubel, C., G. C. Fernandez, F. A. Rosa, S. Gomez, M. B. Bompadre, O. A. Coso, M. A. Isturiz, M. S. Palermo. 2002. Soluble fibrinogen modulates neutrophil functionality through the activation of an extracellular signal-regulated kinase-dependent pathway. J. Immunol. 168:3527. Borregaard, N., J. B. Cowland. 1997. Granules of the human neutrophilic polymorphonuclear leukocyte. Blood 89:3503. Metzger, J., K. H. Wiesmuller, R. Schaude, W. G. Bessler, G. Jung. 1991. Synthesis of novel immunologically active tripalmitoyl-S-glycerylcysteinyl lipopeptides as useful intermediates for immunogen preparations. Int. J. Pept. Protein Res. 37:46. Vignais, P. V.. 2002. The superoxide-generating NADPH oxidase: structural aspects and activation mechanism. Cell Mol. Life Sci. 59:1428. Choi, M., S. Rolle, M. Wellner, M. C. Cardoso, C. Scheidereit, F. C. Luft, R. Kettritz. 2003. Inhibition of NF-κB by a TAT-NEMO-binding domain peptide accelerates constitutive apoptosis and abrogates LPS-delayed neutrophil apoptosis. Blood 102:2259.